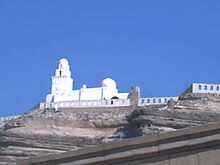 The Juyushi Mosque (Arabic: الجامع الجيوشى‎ "Mosque of the Armies") was built by the vizier Badr al-Jamali who was "Amir al-Juyush" (امير الجيوش, "Commander of the Armies") for the Fatimid Caliphate. The mosque was completed in 478 AH/1085 CE under the patronage of Caliph-Imam al-Mustansir Billah. 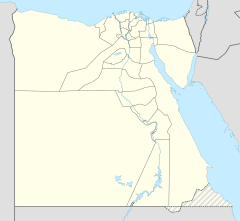 It was built on an end of the Mokattam to ensure a view of Cairo. In the Ottoman period, the mosque was probably used by Sufis as a monastery. The foundation of the mosque has an inscription which identifies the structure as a mazar (Arabic: مشهد‎ "shrine"). The mosque has one dome and a minaret. There is a small courtyard in the center of the mosque. The entrance is a door to the minaret situated besides the prayer hall. There are 2 rooms, one on each side of the minaret. The minaret is a rectangular shaft with a second receding story. On this, there is a dome similar to the one above the mihrab. The Minaret is embellished with muqarnas cornice. A striking feature of the interior is the mihrab, which is framed by a panel of alternating bands of Quranic inscriptions and arabesque leaf patterns, all in carved stucco. This Mosque/mashhad was also known as a victory monument commemorating Vizier Badr's restoration of order for the Imam Mustansir. And the places of worship are for God, so invoke not any one along with God. Never stand thou forth therein. There is a mosque whose foundation was laid from the first day on piety; it is more worthy of the standing forth therein. In it are men who love to be purified; and God loves those who make themselves pure. The construction of ...Mashad...ordered by...Imam al-Mustansir....may the blessing of God be upon him ...his Forefathers, the pure Imams.....make his word prevail and deceive his enemies....as he seeks the good pleasure of God..Moharram 478. The mihrab is elaborate with stucco carving with spandrels upon the arch. On the exterior of mihrab is inscription of verses 24:11, 24:36, 24:37 and 10:23. Those who brought forward the lie are a body among yourselves, think it not to be an evil to you, On the contrary, it is good for you. To every man among them of the sin that he earned. And to him who took on himself the lead among them, will be a penalty grievous. In houses, which God has permitted to be raised to honor; for the celebration, in them, of His name. In them is He glorified in the mornings and in the evenings. By men whom neither traffic nor merchandise can divert from the Remembrance of God, establishing Prayer or giving Charity: Their fear is for the Day when hearts and eyes will be transformed. But when he delivers them they transgress insolently through the earth in defiance of the truth. O mankind! your insolence is against your own souls, an enjoyment of the life of the present: in the end, to Us is your return, and We shall show you the truth of all that you did. Verily We have granted you a manifest Victory. That God may forgive you your faults of the past and those to follow; fulfil His favour to thee; and guide thee on the Straight Way. And that God may help thee with powerful help. It is He Who sent down tranquillity into the hearts of the faithful, that they may add faith to their faith; for to God belong the Forces of the heavens and the earth; and God is Full of Knowledge and Wisdom. That He may admit the faithful men and faithful women, to Gardens beneath which rivers flow, to dwell therein, and remove their ills from them; and that is, in the sight of God, the highest achievement. He it is that has made you inheritors in the earth. If, then, any do reject, their rejection is against themselves, their rejection but adds to the odium for the deniers in the sight of their Lord. Their rejection but adds to undoing. By the 20th century, the mosque was a ruin. After having researched the structure, the mosque was rebuilt by the Dawoodi Bohra community under the leadership of Syedna Mohammad Burhanuddin. Architectural elements from other Fatimid structures in Egypt were used as clues as to what to put where during the restoration. ^ Islamic Architecture in Cairo: An Introduction. 1989.